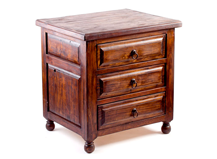 Our Rustic Furniture is always 100% handcrafted and made to order. All of our furniture is unique and can be customized to your liking. 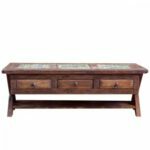 If you would like another style than rustic furniture, please contact us or email us a picture of the piece you'd like to have and we'll have our craftsman review it to see if we can match a similar piece for you. We also have unique home decor, such as mirrors and other accessories match your furniture perfectly. We strive to have 100% customer satisfaction, so we allow our customers to choose their own stains if desired. 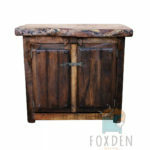 Browse our unique selection of rustic bathroom vanities! Our vanities are crafted from solid wood and come sealed and protected from water damage. Browse ours or design your own! 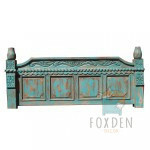 We offer a range of rustic beds that are uniquely individual. Each bed is sold in either twin, full, queen or king and color can be customized. Big or small, we carry or can design it all! Unique designs to match an existing bedroom set or choose one of our designs available. Spruce up your home with a hand crafted rustic table! We carry coffee tables, end tables, sofa tables, door top tables and much more! 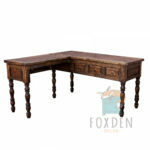 Rustic desks that are perfect for the work place or a home office. Built with a thick frame to withstand heavy use.